You may know an amphora as a type of large two-handled Grecian vase originally designed for storage. But the name Amphora, which was stamped on many wares dating to the late 1800s and early 1900s, also refers to art pottery produced in the Turn-Teplitz region of Bohemia during the Art Nouveau era. These wares are referred to by dealers and collectors as “Teplitz” from time to time as well. The first Amphora manufacturer was Reissner, Stellmacher & Kessel using a red “R St. K” mark beginning in 1892. The company was founded by Alfred Stellmacher. Combining unusual shapes with striking glazes, this company is recognized as the best in Amphora although there were many other manufacturers of ceramic wares in the Turn-Teplitz area by 1900. R. St. K.’s work was introduced in the United States in 1893 at the Chicago World’s Fair where it was given the “best in show" award. The company's display at the St. Louis World’s Fair in 1904 also earned high accolades bolstering its reputation as a pottery master. More than a century later, R. St. K.'s products still have a following among pottery fans. The art pottery vases crafted by R. St. K. are said to have competed with Grueby and Rookwood produced during the same time frame. That may be true, but Amphora is generally noted for more elaborate and flowing Art Nouveau influences in comparison to its contemporaries. One particular style associated with Amphora is the “drop edge candle vase” now highly prized by collectors. Many Amphora pieces included snakes, brightly plumed birds, bats, and even mythical dragons weaved cleverly into their designs. These can be some of the most expensive pieces to own as well. In fact, the collection of Les Cohen auctioned in 2012 held a number of these valuable Amphora pieces and many of them sold for well into the five figures. In addition to many elaborate vases, Amphora artistry refers to intricately-crafted female busts as well. These pieces reflected the finest of craftsmanship and the most delicate of detailing. The larger busts were expensive even by early 20th century standards so fewer were produced compared to smaller pieces. For collectors today, this makes those large and lovely examples harder to find and more avidly coveted. Finding them without some type of damage to their finely-crafted detail more than 100 years since they were crafted also adds to their value. One of the recognized artists working in the Turn-Teplitz region was Paul Dachsel, son-in-law of Alfred Stellmacher, who decorated works made in the R. St. K factory from 1892 through 1905. These were sometimes marked PD in addition to the factory marks used at the time. Pieces with Dachsel’s signature have their own avid following in collecting circles. He left R. St. K. in 1905 to start his own company. The Turn-Teplitz area of Bohemia drew on the rich tradition of fine ceramic wares made in nearby Dresden, Germany. In addition, the Imperial Technical School for Ceramics & Associated Applied Arts not only produced beautiful ceramic wares beginning in 1885 but trained many of the Amphora artists who worked in the area through 1917, when the school closed. Students learned complex clay manipulation that incorporated nature-inspired Art Nouveau themes as well as developing their decorative skills and a keen eye for design. 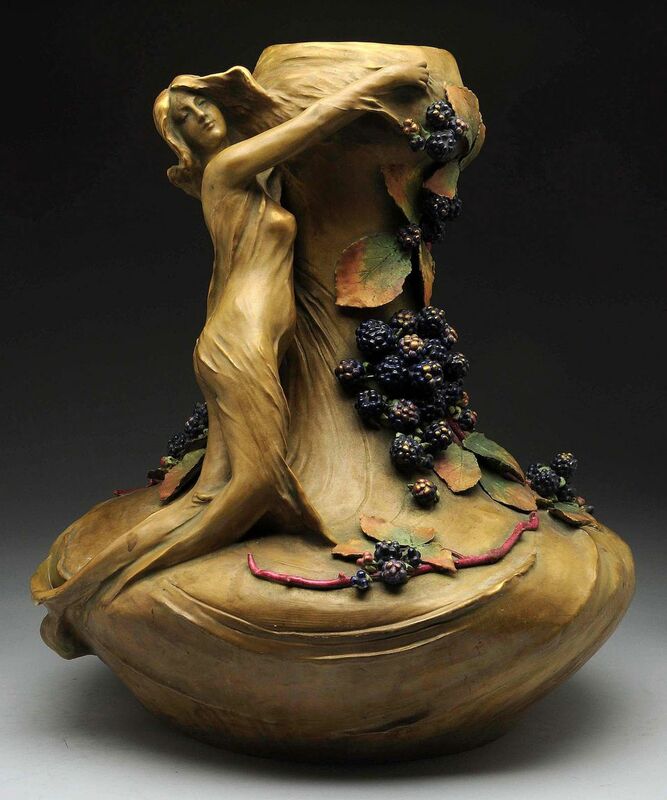 A good reference for boning up on knowledge about the Art Nouveau era and more on Amphora manufacturers and designs is Art Nouveau, 1890-1914 by Paul Greenhalgh. You can also try to hunt down a copy of the out of print title Monsters and Maidens - Amphora Pottery of the Art Nouveau Era by Byron Vreeland. This book includes many of the most captivating, and sometimes frightening, examples of Amphora that avid collectors seek today.